This Starter Kit is designed to help you get used to Provent, by increasing therapy resistance, over several nights to create a gradual transition to successful EPAP therapy. DirectHomeMedical is excited to launch the all new Provent Starter Kit from Ventus Medical. 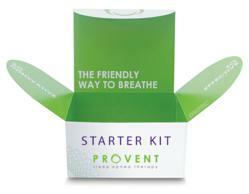 The Provent Starter Kit is specifically designed to help people with Obstructive Sleep Apnea (OSA) adjust to Provent Therapy by introducing a gradual exposure to expiratory positive airway pressure. Provent Therapy is an alternative, FDA Approved treatment for Obstructive Sleep Apnea (OSA) and related snoring -- that DOES NOT require a machine, mask or medications. Provent is clinically proven to be effective for the treatment of mild, moderate, and severe OSA and related snoring, and can restore the energy that comes with a good night's sleep. The Provent device is placed just inside the nostrils and is held in place by a hypoallergenic adhesive. The expiratory resistance created by the Provent device helps maintain an open airway during sleep and prevents a collapse of the airway. The Starter Kit has a convenient 3-phased approach gradually increasing expiratory resistance and aiding the adjustment to Provent Therapy. The full therapeutic effect is reached on night 5. Market research has demonstrated that patients had an easier time falling asleep and slept better with the Provent Starter Kit. Provent Therapy has now been proven in more than 10 clinical trials and used in over two million nights of sleep. This unique technology, elegant design and proven efficacy makes it ideal for all OSA patient types. DirectHomeMedical.com is dedicated to providing quality, affordable sleep therapy and oxygen products to patients nationwide. With nearly 1,000 products in stock and ready to ship at all times we pride ourselves in quick, courteous service and unparalleled customer support. DirectHomeMedical is an authorized supplier for all major sleep therapy and oxygen product manufacturers including ResMed, Philips Respironics, Fisher & Paykel Healthcare, Puritan Bennett, Hans Rudolph, Covidien, Ventus Medical, Cardinal Medical, DeVilbiss, SeQual, Inogen, and others. DirectHomeMedical.com offers a complete range of CPAP machines, BiPAP machines, CPAP Masks, Portable Oxygen Concentrators, Stationery Oxygen Concentrators, Cannulas, and other oxygen and sleep therapy supplies.